If you'd like to share a testimonial about your experience at Children's Hospital, we would love to hear from you. Just complete the form below and submit. We'll contact you if your story is selected to be shared more broadly in our online community. Please note - this form is for patient testimonials and Children's Hospital stories of healing only. If you have a compliment or a complaint a representative can be contacted directly at 423-778-7990 or by sending an email to: GuestRelations@erlanger.org. Include your name, contact information, and details about the compliment or complaint. Are there any caregivers you would like to recognize? By execution of this testimonial form, I hereby authorize Erlanger, its affiliated companies, and/or their legally authorized representatives to acquire and utilize my name, image, written expression, or other representation. I understand that I may be identified by name in printed, Internet, or broadcast information that might accompany the testimonial, interview, photograph, or image. I understand that by signing this release, the testimonial, interview, photograph or image becomes the property of Erlanger, the news media, and/or external publications. I attest that information provided pursuant to this authorization is, to the best of my knowledge, complete and accurate as of the date of this release. If there is any special limitation as to the uses authorized by this release, or if there are conditions as to time, remuneration, media, or other circumstance, they are listed below. This Release covers all usages and releases Erlanger, its directors, members, trustees, officers, employees, and agents and my physician(s) and any other person participating in my care from all claims, demands, causes of action and suits, including but not limited to claims for invasion of privacy, defamation, breach of contract, or other breach of duty arising out of, or in connection with, the use of this testimonial, interview, photograph, film, or video. I have read, or have had read to me, the above statements, and understand them as they apply to me. I further understand that I may revoke this authorization at any time, except to the extent that action has already been taken in accord with this authorization. In order to revoke an authorization, a written document stating the intent of the patient/visitor/employee to revoke such authorization must be either presented in person to or delivered by certified mail to the Chief Privacy Officer of Erlanger Health System. This document must contain the signature of the patient or patient’s legal representative, and that signature must be formally certified by a Notary Public. By agreeing to these terms and conditions, I certify that I am the named individual, and that I am an adult and legally competent to execute this Release, or I am the duly authorized legal guardian/representative/agent of the named individual, and I am empowered to execute this Release. 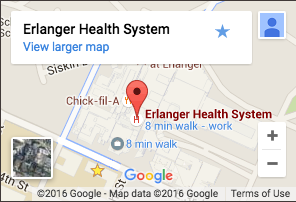 Erlanger Health System is an academic medical center affiliated with the University of Tennessee College of Medicine Chattanooga. The Erlanger Foundations advances Medical excellence in our region through investments in technology, clinical programs, medical education, research and facilities. Patient Privacy Practices | Disclaimer | © 2019 Erlanger Health System. All rights reserved.